Hi, I am interested in your 1962 Chevrolet Corvette (stock #1124-NSH) listed on Autotrader for $48,995. I'd like to get more information about this vehicle and confirm its availability. 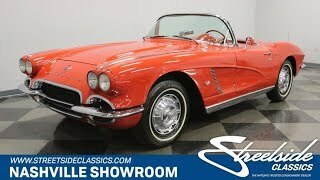 1962 was the end of an era for the Corvette. Harley Earls initial concept car went from show, to go, very quickly in 1953. By 1962 the cars design had been refined and the power improved to the point where it had earned a well-deserved reputation for performance and fun and was a legitimate rival for any sports car in the world. This one could become yours. Check it out. Red is just a great color for these cars. They had gotten away from the two-tone treatment and that gave the cove down the side of the car a whole new look. The sharp creases of the new rear fenders and the duck tail look would carry on and be refined on the next gen cars, but 1962 would be the last Corvette with a conventional trunk until the C5 convertible in 1998, and the 4 round taillight look would carry through on the back of all Vettes until 2014. Up front, the hood sloped down between quad headlights perched up on the fenders to an oval grill. A bar across the center visually connects the bumpers on each side which split side vents and wrap around the edge of the fender. It is all trimmed in a bold band of chrome and has Corvette in script on the hood along with those iconic crossed racing flags. Open the door and the Red with Chrome look continues on the interior. You might notice the ribbed aluminum rocker treatment and the polished door sill plate protecting it from scrapes as you slide in. The door panel itself has a smooth upper and a pleated lower with a nice armrest divided by a slash of chrome. A big red steering wheel with a Corvette center button sits in front of an arched dashboard with the speedo on top, the tachometer in the center and four pods for the fuel, temp, battery and oil gauges to the sides. There is a rear-view mirror perched on the dashboard just like the European cars of the day and below that is the radio, ventilation controls and clock. The shifter for the 4-speed manual trans falls easily to hand and just begs to be stirred around. The passenger has a grab handle in front of them with an aluminum trim in the cutout with Corvette spelled out, and the seats have been nicely recovered with pleated seating surfaces surrounded by smooth vinyl. Open the hood and you will find a period correct 327 V8 engine nestled down in a neat and clean engine bay. 1962 was the first year the more powerful 327 was offered, replacing the 283. The car has signs of good regular maintenance with a new alternator, belts and hoses. Its topped by a chrome air filter housing and has finned aluminum valve covers with Chevrolet in script. No real frills or fancy stuff here, just an honest engine compartment with a survivor flavor to it. The chassis of the car is about the same with signs of good regular maintenance. Front disc brakes are a nice feature that will get the car hauled down to a stop in a hurry, and there are sway bars both front and rear. The rubber meets the road through 205/75R15s mounted on steel wheels with center spin hub caps. The best and last of the first-gen Corvettes. A legit rival for any sports car of the day. And the end of an era. This one could be yours. Come on down and check it out.